The water in the small creek was much lower than it was a week ago when it had ice in the calm areas. Buffy and I left later this afternoon than usual for a short outing to break up the monotany of the day. The sun was too low for pictures in the creek, so we meandered through the woods instead. Gentle water trickled behind me, and the 3p.m. sun angled tree shadows through the woods. Moss grew on the ground, on rocks and the base of tree trunks. Chorus frogs gave their “creeeeek” calls from a nearby wet area. A crow cawed as it flew over. Early spring wildflowers were sprouting in profusion, and a few were starting to bloom. This is early for southern Illinois. Our temperatures have run above average for most of the winter. Snow only accumulated once and melted that afternoon. Tiny white flowers bloomed on spring cress and little yellow ones on corydalis. Feathery leaves of the corydalis were common along with leaves of cut-leaved toothwort, purple dead nettle, Dutchman’s breeches and chickweed … and then I found my first spring beauty flower of the year. 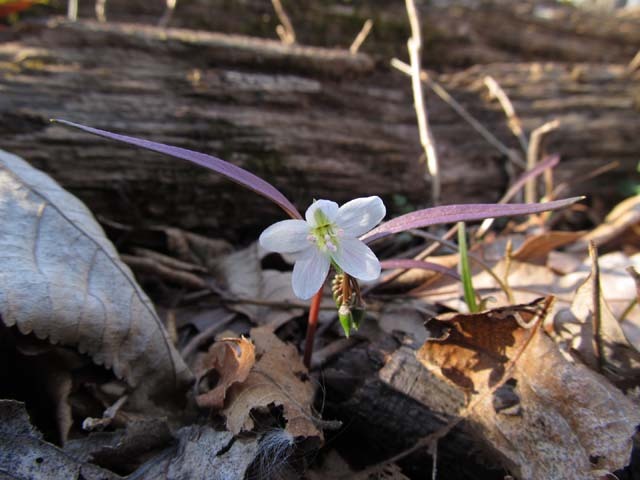 Spring beauties (Claytonia virginica) are common in moist woods. They have 2 opposite linear leaves that can either be purplish like in the picture or can be green. The petals have pale pink veins. The petals can also be pale pink with darker pink veins. The plants grow 4-5 inches tall. A tight cluster of buds hangs behind the flower petal on the right in the picture. The plants grow taller as the raceme unfolds and more flowers bloom. Even if a wildflower is common, the first of the season is always a treat. The light was right for a change, and I could photograph the bark beetle designs on this log. Bark beetles are 1/8 inch long, and all of them feed on the layer of wood between the bark and trunk of live trees. Usually they pick trees that aren’t the healthiest. 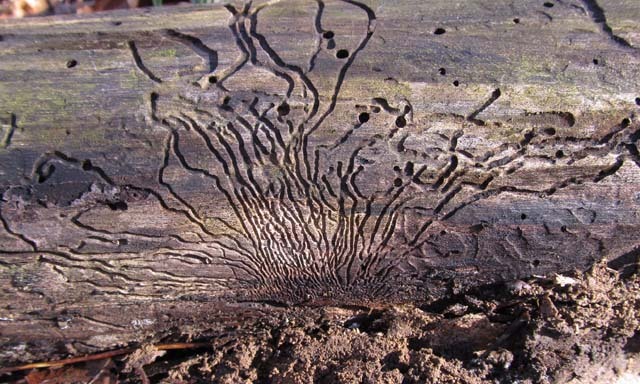 Different bark beetle species create different tunneling patterns. Look closely at the base of all the tunneling to the wider horizontal tunnel (which would have been vertical when the tree was still alive). A female made the tunnel and then laid her eggs in niches along the side. I assumed she probably laid eggs on both sides of the tunnel, but I couldn’t tell for sure because it was on the underside of the log. It may be hard to see in the picture that there are teeny parallel tunnels coming up from the main tunnel. The tunnels grew bigger as the larvae grew. When they matured, each made an enlarged space to pupate in. The adults emerge from their pupal stage in the spring and then bore out through the bark. From there, they fly to new trees and start the cycle again. There can be 1 or 2 broods a year. Long tunnels of the same width are made by adult beetles. This second picture shows the tunneling pattern of a different bark beetle species. It better shows how the larvae fed out from the main tunnel. These tunnels weren’t nearly as long as the ones above. Bark beetles use both deciduous and coniferous trees. These can be found in mature woods with downed trees. Downed trees, in various degrees of decay, can be quite fascinating. You won’t find me and Buffy staying home when the temperature’s to reach 70 today and then drop to 33 tomorrow. We made a casual loop thru both barrens and the ravine. My property is U-shaped with 13 acres of Shawnee National Forest land coming in the center from the south. A wet-weather creek runs through the wooded ravine (left in the picture). Woods and a sandstone barrens occur on both sides of the ravine. A barrens is a grassy plant community, similar to a prairie, only with more trees. My property is a registered Land and Water Reserve, a program through the Natural Heritage Division of the Illinois Department of Natural Resources. It was accepted as a reserve because of the barrens, which is an uncommon plant community, and because of a few threatened and endangered plant species. A Land and Water Reserve is one step below a nature preserve. It allows us to hunt and camp on the land. Neither are allowed on nature preserves. ATV’s, horses and trespassing are not allowed. We aren’t allowed to cut trees or do anything to alter the land. It will always remain a reserve. The trees in the barrens are predominately oaks and hickories … and pesky sumacs. The state does prescribed burns, alternating barrens, according to the management plan. Without these burns, the sumacs would increase along with other trees, and the barrens would eventually become a woodlands. Fire doesn’t hurt the prairie plants because of their deep root systems. It does control invasive plants which have shallow roots. The height of the little bluestem grass and the abundance of flowering plants depends on the amount of rainfall through the growing season. The tall grass in the barrens is beautiful covered with dew in the early morning, with snow and/or ice in the winter, when the tall seeded stalks blow in the wind, and late in the summer when flowers bloom in abundance and in many colors. The barrens is also definitely beautiful in the light of a full moon. The second part of a 2-part blog. Buffy and I started back the way we came along the bluff. The black vultures were still on the ledge, and they didn’t seem concerned by my presence. I wore a camouflaged coat and drab pants. We have both black and turkey vultures in southern Illinois. Turkey vultures are the most common. They both spend the winter not far south from here, and both began returning early because of our exceptionally mild winter. I knew these were black vultures because of their black head. Turkey vultures have a red head, except for the immatures which have a blackish head. 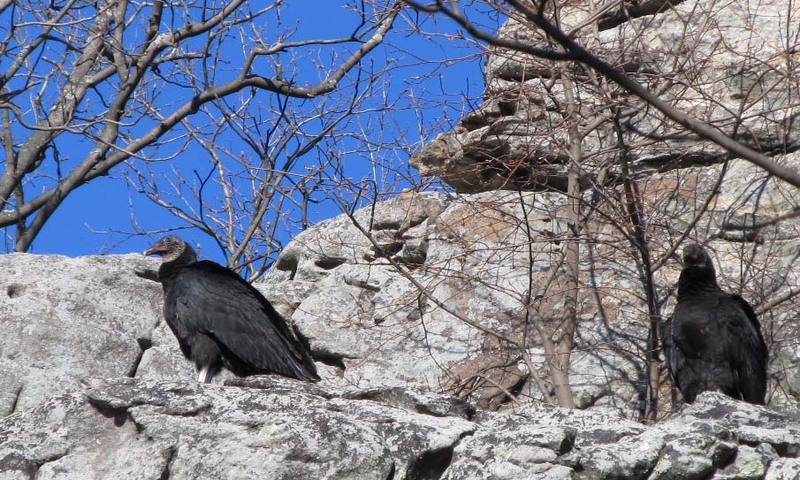 Black vultures have a 23-27 inch wingspan, a white patch underneath near the wing tips, and a short square tail. They lay 2 eggs in tree cavities or shallow caves. Turkey vultures have a 26-32 inch wing span, and their tail is longer and narrow. They’re black overall except for gray on the underside of their flight feathers. Their 2 eggs are laid in old barns, hollow stumps or logs, and rock crevices. A great hike just got even better! First part of a 2-part blog. It was probably better I didn’t know the elevation from the truck to the base of the sandstone bluff. The trail was steep enough to require switch backs. 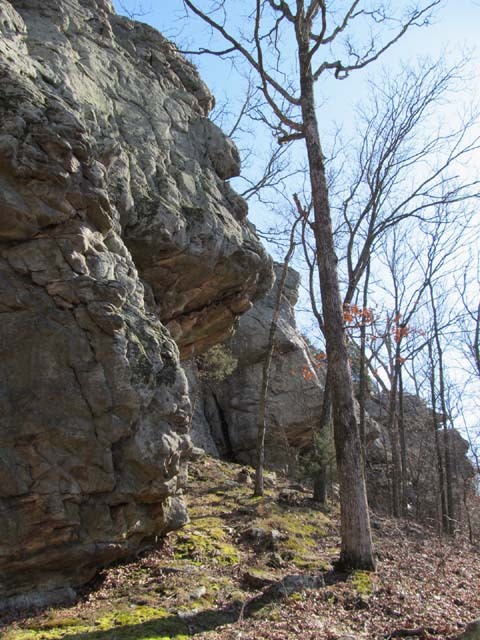 Buffy and I hiked at Stone Face, a site on the Shawnee National Forest. The view from the base of the bluff extended 15-20 miles into a blue haze. We followed the trail along the bluff. It wasn’t the easiest place to hike with the ups and downs, and with so many rocks at the surface. I kept taking pictures of the bluff, turning often to check for picture possibilities behind me. Imagine my surprise when I turned and there was a black vulture on a ledge! Another one walked out of a crevice to join it. I took a few pictures. Buffy and I then walked a little farther and stopped. We sat side-by-side, eating a snack. She was content just to sit, looking around and smelling the smells. A light breeze rustled dry leaves remaining on small trees nearby. No traffic sounds reached us. No other people were there. I prefer to hike where there’s as few people as possible. That way I can completely immerse myself in the experience. We started back the way we came. The vultures were …. Continued in a second blog for this trip. Obviously, this downed oak tree is a popular place to dine. I would dine here too if I was a gray squirrel. Dining in the woods, listening to the creek gurgle by and sunlight warming the day. 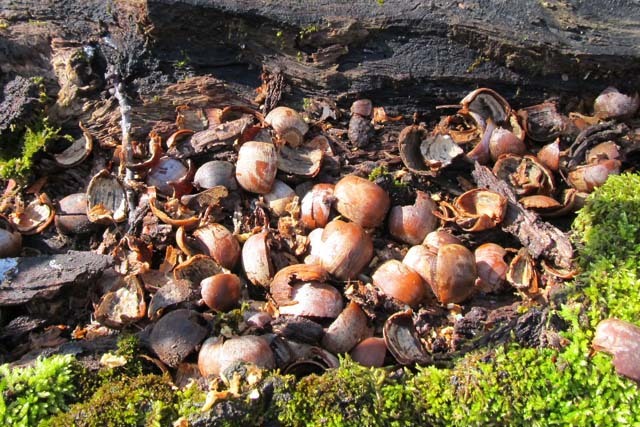 These acorns look to fresh to have been buried in the ground. Gray squirrels also cache acorns and other nuts in tree cavities. They eat nuts in the winter and eat buds, seeds, flowers and mushrooms the rest of the year. They also take mushrooms and put them among twigs or in crotches of a tree to dry. The mushrooms are either eaten dry or added to their cache. Squirrels will also gnaw on bones for the calcium. Gray squirrels build their nests from leaves and sticks, and they also nest in tree cavities. They have 2 broods a year. Lightning downed this tree many years ago. Mosses, lichens and shelf mushrooms now cover most of the bark. A 4-foot strip of bark is missing on the top of the log, with acorns scattered along most of it. An inch-and-a-half hole disappearing into a more rotten part of the wood probably belongs to a mouse. This downed tree is in the ravine on my property, and Buffy and I pass it often on our hikes. It will be interesting to watch activities around the log and its decaying process too. Ice can freeze in endless combinations of shapes and designs. I expected to find ice covering sections of a small creek, because temperatures remained below freezing the last 2 days and in the teens at night. The water meandered over the small rocky creek bed. Its flow increased in narrow sections where it dropped more, and slowed where it spread out pool-like in wider areas. Ice formed in the calmer areas, and there it remained clear because water still touched the bottom of it. 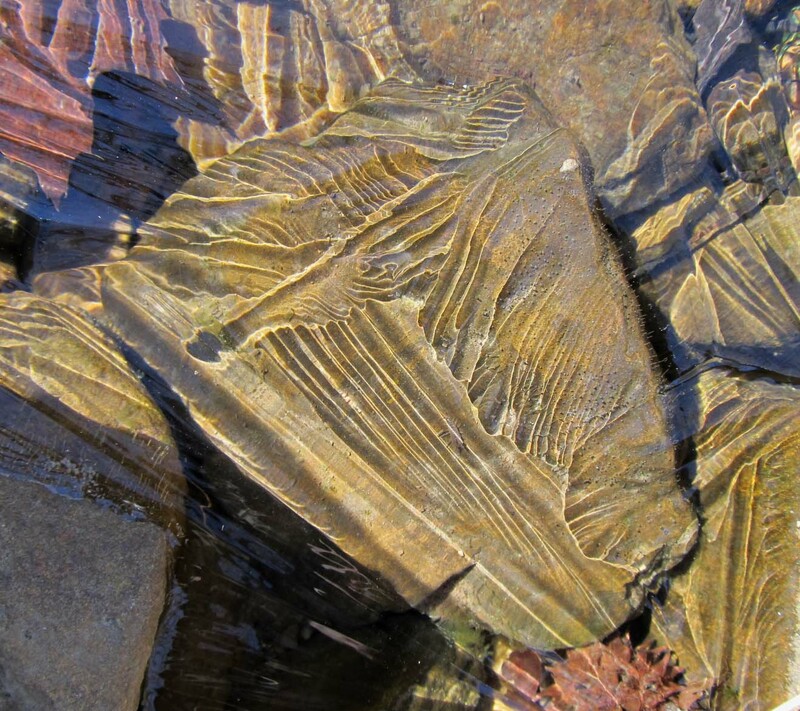 The current caused ripples to form in the ice, and these left shadow lines on the rocks below. Sunlight hitting the thinner valleys cast the yellowish lines. The shadows and highlights in the ice followed the contours of the rocks below. Rocks and sticks at or near the surface created ripples in the narrow areas. Here the ripples cast yellow-rimmed shadows on the rocks below. Water and ice can be so fascinating.